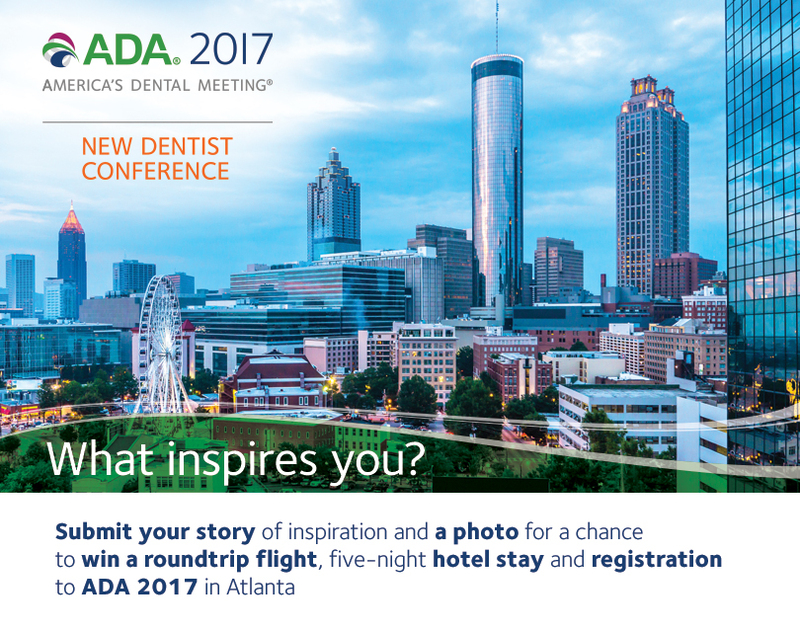 New dentists and dental students can submit their stories of inspiration and a photo for a chance to win a round-trip flight, five-night hotel stay and registration to ADA 2017 – America’s Dental Meeting in Atlanta. The ADA wants to know what inspired or inspires dentists to be dentists. It can be about anything from what or who originally inspired dentists to become one to what or who inspires them on a daily basis, whether it be their team, community, family or patients. The ADA is encouraging dentists and dental students to submit their stories of inspiration (with an accompanying photo — this can be of themselves, their inspiration or something they mention in their story) and vote on another submitted story. The story that receives the most votes will win. The contest opens at 7 a.m. CDT on April 3 and will close at 11:59 p.m. CDT April 30. The ADA will select the winner, based on the greatest number of votes, by May 8 at noon CDT. The contest will be held via the ADA Facebook page, where all entries will be viewable. Registration for ADA 2017 opens May 10. Learn more about the annual meeting at ADA.org/meeting.